Christ’s Psalms, Our Psalms: Daily Meditations for Individuals and Families, ed. Peter H. Holtvluwer, Little Angels Press, 2018. Hardcover, 383 pages, $21.00. In 1972, a hit song was released by the American singer Carly Simon. Since then, the song has been covered numerous times by other singers. The refrain of the song goes, “You’re so vain, you probably think this song is about you.” Sadly, that’s the way many Christians approach the Psalms. Because of our narcissistic age, we may automatically think these inspired songs are primarily about us. Yet the New Testament teaches us to regard them first as the songs of our Saviour and then, only in connection with him, are they about us. This new collection of devotions works on that sound biblical premise. Authored by 16 Reformed ministers, Christ’s Psalms, Our Psalms touches on each of the 150 psalms. Each psalm has at least two devotions, even the short ones like 117 and 131. Psalm 119 is the notable exception with 11 devotions. There are also two appendices. One has devotions on psalms related to events in Christ’s ministry; the other has devotions on psalms for seasonal events like Thanksgiving. While taking into account the context of the entire psalm, the devotions are based mostly on one verse or phrase. Sometimes supplementary readings are included — for example, one of the devotions on Psalm 65 is based on verse 4, and the reading is Psalm 65:1-4 with a supplementary reading from Jeremiah 31:1-14. As mentioned above, each devotion explicitly connects the psalm to Jesus Christ, and through him, to the reader. The devotions are consistently Christocentric, but also include appropriate application. Unlike some devotional books, Christ’s Psalms, Our Psalms does not include prayers, but in most instances the appropriate way to respond in prayer would be self-evident. I took the book for a “test-drive” over the period of about a month. My wife and I used it in our daily devotions together. Obviously we didn’t read every single one of the devotions — we took a sampling. Based on that, we found that the devotions were not only edifying, but well-written, clear, and concise. I’m sure that even older children and teenagers would be able to grasp the content. Greatly enjoying our sample in the last month, my wife and I will go back to the beginning and definitely continue using it psalm by psalm. As the editor, Rev. Peter Holtvluwer deserves a hearty commendation for spearheading this book. According to his website, we can look forward to more from him and his team of contributors. In 2019, they hope to publish a study resource on the Psalms. This will be a full-featured commentary intended mainly for pastors and teachers, drawing out in even more detail how each of the Psalms speaks to us of our Lord Jesus. The kind of spiritual narcissism that sees the Psalms as primarily about the believer is a serpentine poison keeping us from the main point of the whole Bible — God’s revelation of Jesus Christ. If the devotional is any indication, the upcoming study resource will be another potent anti-venom. I look forward to it! 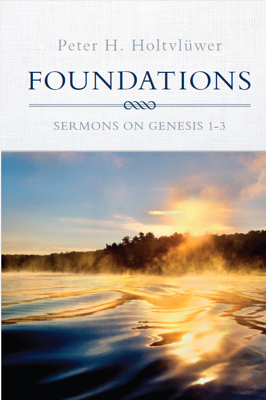 Foundations: Sermons on Genesis 1-3, Peter H. Holtvlüwer, Tintern: Little Angels Press, 2010. Paperback, 163 pages, $15.00. Attacks on the truths of God’s Word never stop. This is also obviously true for the first three chapters of the Bible. Outside the church there are voices that outrightly deny what the Bible says about our creation and fall. Sadly, even inside the church there are voices that undermine what Scripture says about these things. We can be thankful to God for faithful preachers of the Word like Peter Holtvlüwer, minister of the Spring Creek Canadian Reformed Church in Tintern, Ontario. This book contains a series of sermons he preached to his previous congregation in Carman, Manitoba. There are 13 sermons and they cover almost every verse of Genesis 1-3. The sermons retain the style of sermons and they include the sort of references that one might expect from a pastor addressing a rural congregation. There are three reasons why I’m going to recommend this book to you. First, the author takes the biblical text seriously as a record of historical events. There is no capitulation here to Darwinism, theistic evolution, or anything of the sort. Second, Holtvlüwer constantly brings everything to a focus on Jesus Christ. These sermons are Christ-centered and therefore edifying and God-glorifying. Third, Foundations features clearly written prose. The author explains Scripture in a direct and easy-to-understand fashion. Preachers who review other preachers’ sermons are in an awkward position. We all have our own ideas of what should be left in a sermon and what should be left out. In this instance, too, there are some things that I would have liked to seen included. As an example, especially in the light of some current discussions with our URC brothers, it would be good to see a reason why Holtvlüwer regards the covenant in Genesis 3 as a renewal of the covenant from Genesis 2. He appears to assume that this is an obvious fact. Or in chapter 12, he writes that “we often must learn to forgive ourselves too.” Where does Scripture teach that? Again, this seems to be assumed rather than established. Overall, this is a valuable contribution to our Reformed community. Holtvlüwer’s book could be used in public worship for reading sermons – song selections, etc. are included in an appendix. It could also be used with profit for personal devotional reading. Moreover, the author has generously decided to use all the proceeds for this book to support a worthy cause in Brazil. The Reformed Reading Room in Recife is part of Canadian Reformed mission efforts in north-eastern Brazil. God has used it in a fantastic way for the spread of the biblical gospel. Your purchase of this book will contribute to the ongoing dissemination of the good news of Jesus Christ.